Four wooden blocks containing ten cylinders each. 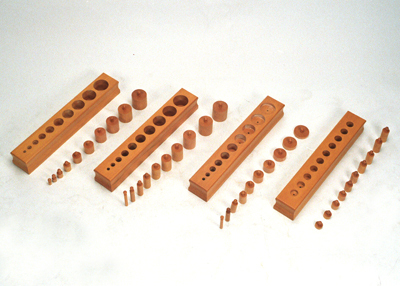 The dimensions of the cylinders increase progressively within each block. See details on block 1, 2, 3 and 4.
to improve small muscle control, dexterity and hand-to-eye co-ordination in indirect preparation for writing. Holding the knobs between finger and thumb prepares the child for likewise holding the pencil.